Mohit holds Mechanical Engineering degree from IIT Delhi (2000), and MBA degree from INSEAD, France (2005). He started his career with Deloitte Consulting based out of Philadelphia, USA. At Deloitte, he focused on conceptualizing and implementing Systems Integrations projects for large enterprises. In 2005, Mohit returned to India to head the Internet Business of The Indian Express Group. He defined a clear business strategy, forged revenue generating business partnerships, and focused on technology and marketing capabilities. In 2007, he joined Hindustan Times as business head of its Content Syndication division. With HT, he planned the business growth strategy, managed operations, and managed all business partnerships. During his tenure he closed several deal both for acquiring new content and for increasing the content distribution network. 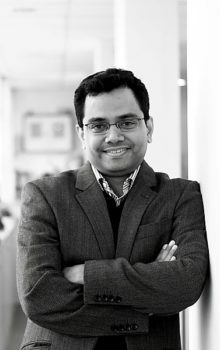 In 2009, after successfully developing businesses for two largest media houses in India, Mohit started Athena Information Solutions, parent company of web portal Contify.com, focused on building technology based information products.